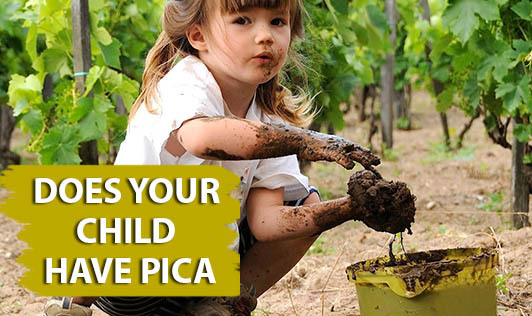 Does your child have Pica? Kids tend to put non-food items into their mouth at one time or another. Pica is a term that refers to cravings for substances that are generally not eatable. These can include stones, chalk, faeces, paint and clothing. While some of the objects that they eat, pass through the body without any harm, Pica can be a very serious eating disorder that can sometimes result in health problems such as lead poisoning and iron deficiency anemia. Pica is common in people with developmental disabilities, including autism and mental retardation and especially seen in children between the ages of 2 and 3. It may also surface in children who have had a brain injury that affects their development. The exact cause of pica is unknown and could be linked to mineral deficiencies; but often, it is due to learned behaviours such as social attention, sensory feedback and escaping from a situation. The signs and symptoms of pica vary with each item ingested. • Recurring consumption of non-food items, in spite of efforts to restrict it for a period of at least 1 month or longer. • Behaviour is considered unsuitable for your child's age or developmental stage (older than 18-24 months). • Eating faecal material often leads to infectious diseases such as toxocariasis, toxoplasmosis and trichuriasis. • Consuming lead can lead to kidney damage and mental retardation. • Eating clay may cause constipation and swallowing metal objects may lead to bowel perforation. • Eating sand or soil may be associated with gastric pain and occasional bleeding. • Chewing ice may cause abnormal wear on teeth. Usually, general behaviour strategies are the most effective treatment approach for Pica. Training children about which food is edible and which is not through the use of positive reinforcement can be very helpful. You can prevent pica by paying vigilant attention to eating habits, especially of children known to put things into their mouths. If your child is at risk of pica, talk to a doctor immediately!